Since we keep our food there, you would think we are more careful about clean our refrigerators are. The truth is, the fridge is one of the most overlooked areas in most kitchens. It is understandable though—cleaning the fridge can be a time-consuming and tedious chore. 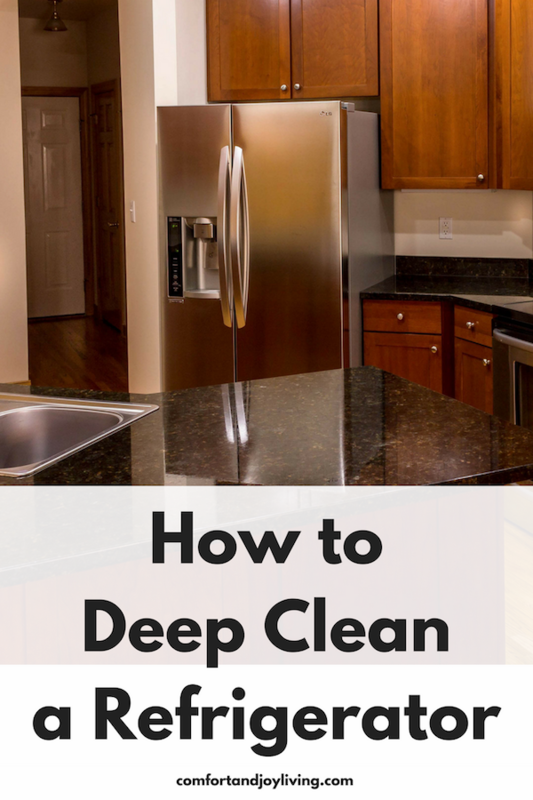 here are some tips on how to deep clean your fridge to make it much easier. Our refrigerators might be one of the most overlooked areas in our home when it comes to cleaning. Constantly in use, this essential appliance usually doesn’t get a second thought. Whether we just don’t thing about it at all or assume that because the food is kept cold or it’s rotated through, that the fridge stays relatively clean, the truth is that cross-contamination, spills, splashes and all sorts of things can spread throughout the fridge from moisture, food, dirty hands and frequent use. In other words, a messy fridge is a health hazard. But that’s not the only problem. Believe it or not, a messy fridge can also cost you money. When our refrigerators become so full that we can no longer find anything, we can waste a og of food from forgotten leftovers hidden behind the milk to produce that goes bad before we remember it is there, to condiments that have been expired for months still taking up space. And, it’s not just food waste that takes a bite out of your budget. Surprisingly, your fridge can increase your energy bill by a lot. Peak efficiency requires plenty of air circulation, clean coils and clean seals that are tight and working properly. You can boost the efficiency of your fridge and lower your energy costs simply by keeping things clean. If it isn’t already, your fridge should definitely be added to your regular cleaning list. Your weekly fridge duties should include wiping down surfaces, disinfecting the door handle, and carefully rotating food as it gets older to prevent spoilage. Food should be properly stored in covered, clear glass containers that can be easily identified and cleaned. Wipe off lids, put a paper towel under items that are likly to drip and pay attention to dates and ages. Even with that weekly schedule, at least a few times a year, you may still need to deep clean your refrigerator. And while that may seem a little overwhelming, I promise that it isn’t as bad as it seems! With a little prep work and this easy to follow plan, you can get this done in less than an hour. Here is what you do. Make sure the fuse or circuit breaker to the outlet is turned off, then unplug the fridge. This can ensure your safety when you’re using water around appliances. Place a towel on the floor to protect your floor from any spills—especially if you have wood flooring in your kitchen. Place the items in the cooler. Check the dates on everything and toss anything that has expired. And if it’s close to he expiration date and you know your family won’t use it by then, toss it. This is the time to purge anything you don’t need. 4. Remove shelves and drawers. With a paper towel or rag, wipe each shelf with the water and baking soda solution—it absorbs odors. For any crusted on food, use a butter or putty knife to gently loosen it. Use the surface spray or a clothed dipped in the cleaning solution. Thoroughly wash the inside, the built-in fixtures, the bottom of the fridge and the whole inside of the door. Use your butter knife again where food particles may have collected. Make sure the inside is fully clean and dry before replacing the shelves and drawers. You should wipe the shelves and drawers dry with a soft cloth or paper towel. One of the dirtiest areas of the fridge is the door seals. The folds can collect debris, crumbs and can also grow mld and mildew. Be sure to clean them thoroughly and dry them well. This will help prevent mildew and keep the seal tight and working at maximum efficiency. Carefully pull the fridge out from the wall and vacuum the coils to remove dust that may have collected. Carefully remove the grate or kickplate from the bottom of the fridge and do the same. If your fridge has a drip tray, remove it and clean it like you did the shelves and place it back. Wipe the lids and anything sticky before putting back in fridge. I suggest placing items like meat and seafood on the bottom to protect any spills from spreading. Place paper towels in drawers and under liquids like milk and juice to absorb condensation and keep things extra clean. Place an open box of baking soda in the fridge to absorb odors. Most freezers these days don’t need defrosting, so they just need a simple cleaning. You should work quickly to clean the freezer. First, remove the items and store in the cooler. Check all expiration dates. Anything you don’t recognize immediately or anything with ice crystals or freezer burn on the inside—toss it. Check things that are frozen in a solid mass, such as vegetables or fruit. This is an indication that they’ve been thawed and refrozen, so they should be discarded, due to food borne-illness concerns. Wipe the whole interior like you did the fridge, including baskets and shelving. Wash ice cube trays and replace the ice with fresh water. Place similar items together and keep less-perishable items like frozen vegetables in the door. Organizing and deep cleaning your fridge every season will ensure yo have plenty of extra storage space. It will also help to make your fridge to run more efficiently and be more cost-effective. Most importantly, though, having a clean refrigerator helps keep your family healthy and safe.